Harrison Ford has been everywhere from outer space to doom-laden temples to the future—at least in his films—and rarely has he had to take a step back from filming to allow himself to heal. But turning 72 obviously takes its toll on the body, and he’s been taking an acting sidebar to heal from the injury he suffered on the set of J.J. Abrams’ fanboy extravaganza Star Wars: Episode VII. Thankfully, though, the Oscar-nominated actor is apparently back to walking around like a crutch-less badass again. According to New York Daily News, Ford was photographed walking around without either a cast on his leg or the hands-free crutch that he’d been using to get around in recent weeks. He wasn’t taking part in a massive kickboxing competition or anything, he was just exiting his personal helicopter, for which he’s a licensed pilot. The only way you could tell that he’s even injured is a small white bandage on his foot. That, and all the Internet coverage on the injury. So does this mean that he’ll be heading back into production on Star Wars: Episode VII earlier than previously thought? It was previously reported that Abrams and company had figured out a plan to shift the production schedule around to allow for a two-week delay in August to allow Ford ample time to recover. Obviously he won’t be able to run suicide sprints from one end of the galaxy to the other, but I’m fairly certain the screenplay from Abrams and Lawrence Kasdan wisely avoids putting Han Solo into any ridiculously athletic scenarios. 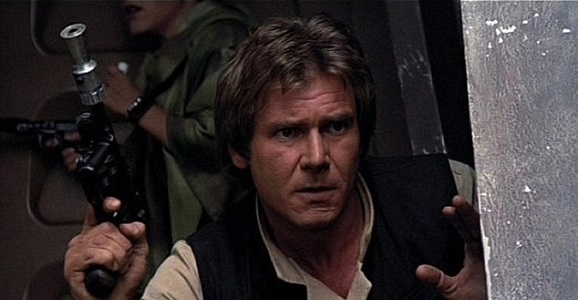 Is it just me, or is anyone else surprised that Abrams didn’t try and hide the fact that Ford was healing nicely? The main things we know about Episode VII involve the casting, and the fact that it takes place 30 years after the Battle of Endor. Ford will be re-joined by Mark Hamill and Carrie Fisher, who will enter the universe of a whole host of new characters. The cast includes Adam Driver, Andy Serkis, Max von Sydow, Lupita Nyong’o, Gwendoline Christie, John Boyega, Oscar Isaac, and more. Expect plot details to be leaked out about fifteen minutes before the film is first screened for audiences. 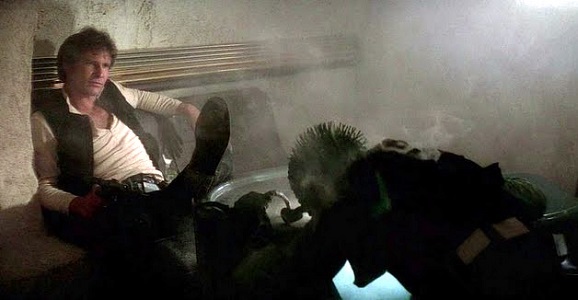 Only time (and perhaps a revisionist version) will tell whether Harrison Ford provoked the Millennium Falcon door first, causing it to fall on his leg, or if the door is the one that made the first move. Either way, it’s good to know that the veteran actor will once again be keeping safe a part of our galaxy that isn’t Earth. Find Star Wars: Episode VII in theaters on December 18, 2015.